(CBS/AP) HAVERHILL, Mass. - A Massachusetts teenager was sentenced Wednesday to spend a year in jail for a fatal traffic accident that happened while he was texting. 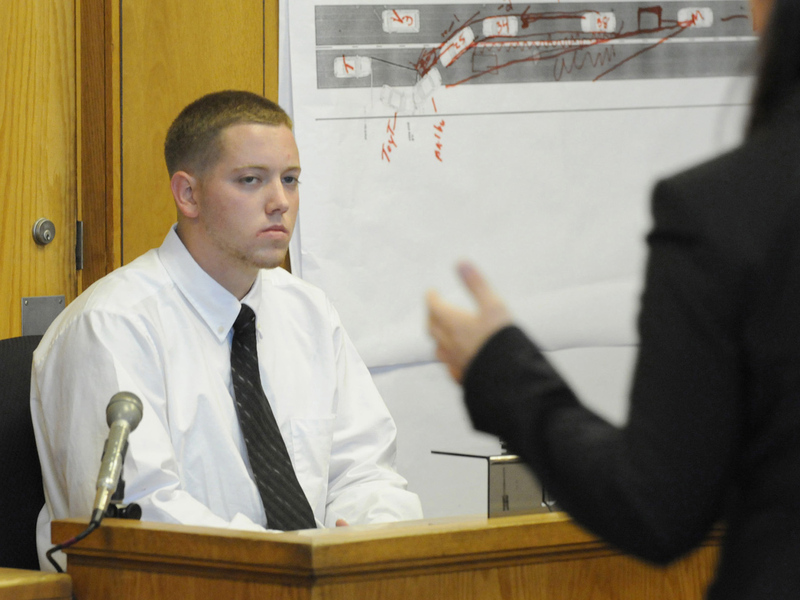 Aaron Deveau of Haverhill was sentenced to two-and-a-half years behind bars with a year to serve and the remainder suspended for the February 2011 crash that took the life of Donald Bowley Jr., 55, of Danville, N.H., and seriously injured Bowley's girlfriend. Prosecutors say the then-17-year-old high school student sent 193 text messages the day of the crash, including some just a minute or so before impact and dozens more after it. The conviction represents the seriousness with which government officials are taking the problem of texting-while-driving. U.S. Transportation Secretary Ray LaHood announced Thursday an initiative to tackle the risks posed by distracted driving, while also unveiling $2.4 million in federal support for California and Delaware that will expand the Department's "Phone in One Hand, Ticket in the Other" pilot enforcement campaign. "Distracted driving is an epidemic. While we've made progress in the past three years by raising awareness about this risky behavior, the simple fact is people are continuing to be killed and injured - and we can put an end to it," LaHood said in a press release. States across the nation are adding laws to their books that make distracted driving - talking or texting on a cell phone while behind the wheel - a jailable crime. According to the Governors Highway Safety Association, 39 states, D.C., Guam and the Virgin Islands ban text messaging for all drivers, with varying degrees of punishment, while an additional five states prohibit text messaging by novice drivers. Ten states, D.C., Guam and the Virgin Islands prohibit all drivers from using handheld cell phones while driving. While nearly all state laws do not restrict the use of hands-free devices, local governments are beginning to prohibit that as well. Chapel Hill, N.C., recently became the first municipality in the nation to ban all mobile phone use while driving, and Evanston, Ill., may soon follow suit. The Chapel Hill ban, however, is on hold after a towing company hauled an appeals case to court in early May and won an injunction against the city, reports AAA. While the laws are there, ticketing, arrests and convictions remain inconsistent and infrequent. The case of Aaron Deveau is a rare example of a felony conviction involving jail time for texting and driving. In April, 23-year-old Erica Nelson of New Richland, Minn., got 10 years of probation after she pleaded guilty to texting-while-driving when she crashed into and killed 58-year-old motorcyclist Ronald Berschman of Buffalo Center, Iowa, in August 2010. A Haverhill District Court jury convicted Deveau of motor vehicle homicide and negligent operation while texting. Family members of both Deveau and Bowley, sitting just feet from each other in court, cried and hugged as the verdict was read. Deveau apologized to Bowley's family. He was among the first people convicted under a law that took effect in September 2010 that created the criminal charge of texting while driving negligently and causing injury. Deveau faced that charge for the injuries caused to Bowley's girlfriend. Now 18, Deveau, who had faced a maximum of four years behind bars, also was ordered to perform 40 hours of community service and surrender his driver's license for 15 years. Police say Deveau's car crossed the center line on a Haverhill street and crashed head-on into Bowley's vehicle. Bowley, a father of three, died 18 days later of injuries authorities say he suffered in the crash. His passenger and girlfriend, Luz Roman, had an extensive stay in the hospital recovering from her injuries. "This has been giving me a lot of pain. There are no words to describe," Roman said outside of court Wednesday. Bowley's sister, Donna Burleigh, said, "We hope this sends a message that it's not OK to text and drive." Deveau testified Tuesday, saying he was not sending or receiving text messages in the moments before the collision. He said he put his phone on the passenger seat and was distracted and thinking about his homework when the crash occurred. He told police after the crash that he swerved to avoid another vehicle in front of him that suddenly hit its brakes. His lawyer, Joseph Lussier, said prosecutors failed to prove that Deveau was texting at the time of the crash. Lussier said the number of texts Deveau sent that day was irrelevant.